So, the Chimer departed. They credited the Good Daedra with teaching them the principles of their new way of life. Worship of Aedra such as Akatosh, disappeared from their legends. 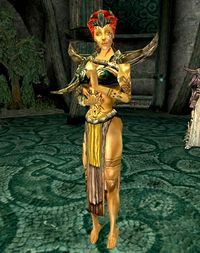 They typically associate most of the things they learned with Boethiah, but Mephala is credited with teaching them the ways of evasion and assassination, and Azura with teaching them how to be different from the Altmer. 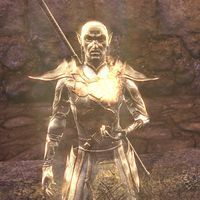 The Good Daedra also warned the Chimer of the "Bad Daedra", such as Molag Bal, who sought to spoil Chimeri "purity". In their new homeland, which they called Resdayn, they quickly came into conflict with both the Orcs and the Dwemer. With the Dwemer, especially, territorial disputes combined with religious animosity created a great deal of conflict. Historians blame the Chimer for provoking these conflicts. Regardless of who started it, the Chimer were generally on the losing end of these conflicts. Though they wielded great magic and had fine warriors, the Chimer were a small group, and the Dwemer had an incredible technological advantage. ^ Sinnammu Mirpal's dialogue in Morrowind. Esta página foi modificada pela última vez à(s) 22h53min de 6 de outubro de 2015.